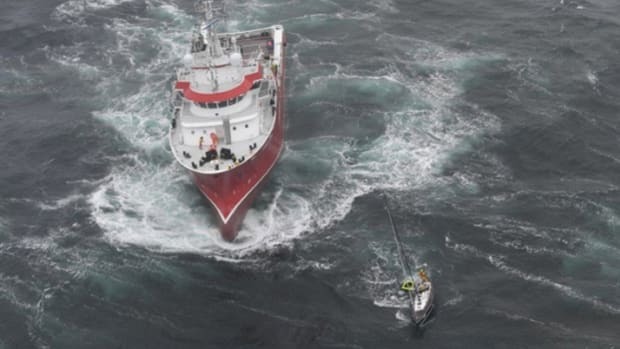 An attempt to rescue eight Russian seamen who had been aboard a cargo ship sinking in gale-force conditions off the northwest coast of Wales has drawn worldwide media attention for one of the pilots of a Royal Air Force helicopter. Two men from the damaged ship were winched to safety Sunday by a helicopter co-piloted by Prince William, the Duke of Cambridge, Princess Diana’s oldest son and the future king of England. The seamen were rescued from a life raft. The prince has been a Sea King co-pilot since he completed his training in 2010. Click play to watch footage of the rescue in this news report. The 267-foot cargo ship Swanland, laden with 3,000 tons of limestone, was broadsided Sunday by what one of the two survivors called an “enormous wave” in the Irish Sea. The vessel broke apart and sank within 15 minutes about 30 miles offshore. The survivors told BBC Wales that they were hoisted to safety after being swept off the deck. “We thought that we would be drifted away and would probably hit the rocks and there’s no chance of survival,” Roman Savin, 26, told the media through an interpreter. The body of one other crewmember was recovered, but the search for the remaining five was called off on Monday.